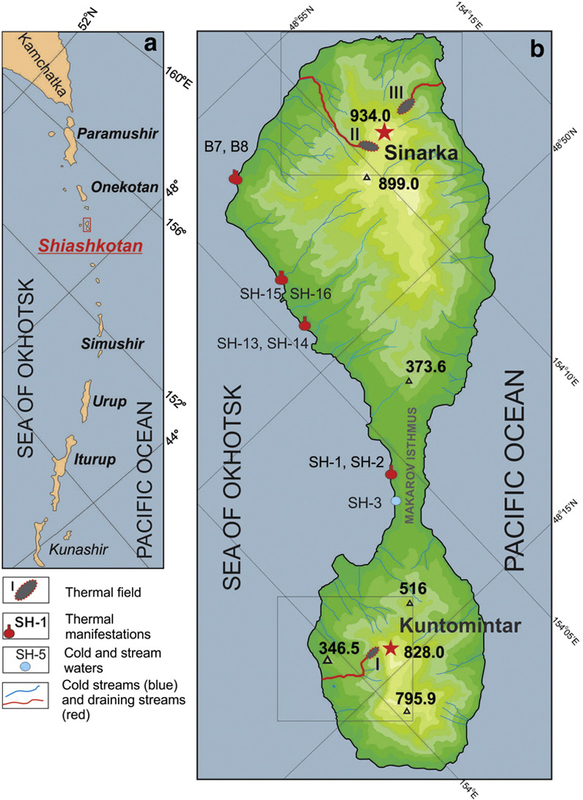 The hydrothermally-active Sinarka volcano (figure 1) is located on the NE end of the dumbbell-shaped island of Shiashkotan, in the Kuril Islands chain, with Kuntomintar in the south (figure 2). Kalacheva et al. (2015) note that the extrusive dome within the central cone exhibits degassing through strong and hot (over 400°C) fumaroles (figure 3). Much of the time the volcano is obscured by clouds from satellite observations, but it is monitored by the Sakhalin Volcanic Eruption Response Team (SVERT). Figure 1. 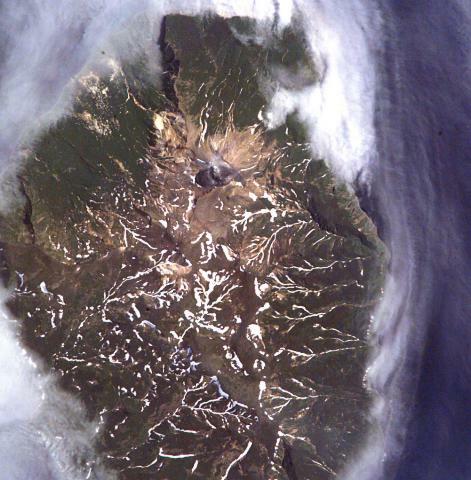 Landsat / Copernicus satellite image showing Sinarka volcano at the NE end of Shiashkotan Island. Courtesy of Google Earth. Figure 2. Map (right) showing Sinarka and Kuntomintar volcanoes along with geothermal features of Shiashkotan Island. Index map (left) shows the location of Shiashkotan within the Kuril Islands arc. Modified from Kalacheva et al. (2015). Figure 3. Photo of the lava dome within the central cone of Sinarka. From Kalacheva et al. (2015); photo by Elena Kalacheva. The Sakhalin Volcanic Eruption Response Team (SVERT) noted volcanic activity at Sinarka between 11 November 2014 and 21 March 2015 (table 1). The primary observations were of a weak thermal anomaly combined with weak steam-and-gas plumes seen in satellite imagery. Plumes sometimes drifted as far as 40-50 km downwind. The cause of the anomalies is unknown. However, on 3 December 2014 the plume reportedly contained minor ash. Table 1. Summary of activity observed at Sinarka volcano from November 2014 to June 2016. Courtesy of Sakhalin Volcanic Eruption Response Team (SVERT). 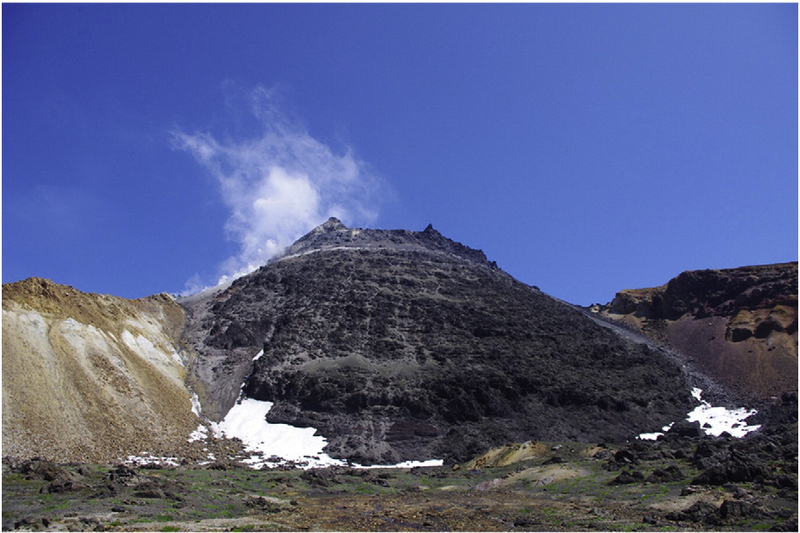 Reference: Kalacheva, E., Taran, Y., and Kotenko, T., 2015, Geochemistry and solute fluxes of volcano-hydrothermal systems of Shiashkotan, Kuril Islands. Journal of Volcanology and Geothermal Research, v. 296, p. 40-54. Information Contacts: Sakhalin Volcanic Eruption Response Team (SVERT), Institute of Marine Geology and Geophysics, Far Eastern Branch, Russian Academy of Science, Nauki st., 1B, Yuzhno-Sakhalinsk, Russia, 693022 (URL: http://www.imgg.ru/en/, http://www.imgg.ru/ru/svert/reports). SVERT reported that activity at Sinarka was not detected during January; on 26 January the Aviation Color Code was lowered to Green. SVERT reported that steam-and-gas emissions detected in satellite images rose 3 km above Sinarka and drifted SE on 5 January. Cloud cover obscured views on the other days during 6-12 January. The Aviation Color Code remained at Yellow. SVERT reported that on 8 December satellite images of Sinarka showed diffuse steam-and-gas emissions. Cloud cover obscured views on the other days during 9-15 December. The Aviation Color Code was raised to Yellow. SVERT reported that on 3 December satellite images of Sinarka showed steam-and-gas emissions with small amounts of ash drifting 40 km NE. Diffuse steam-and-gas emissions were observed on 6 December. Cloud cover obscured views on the other days during 1-8 December. The Aviation Color Code was raised to Yellow. SVERT reported that on 27 November satellite images of Sinarka showed steam-and-gas emissions drifting 50 km SE. Cloud cover obscured views on the other days during 24 November-1 December. The Aviation Color Code remained at Yellow. SVERT reported that satellite images of Sinarka showed steam-and-gas emissions drifted 40 km E on 11 November. The next day a weak thermal anomaly was detected. Gas-and-steam activity became more robust; emissions drifted NE. A weak thermal anomaly was again detected on 16 November. The Aviation Color Code was raised to Yellow. 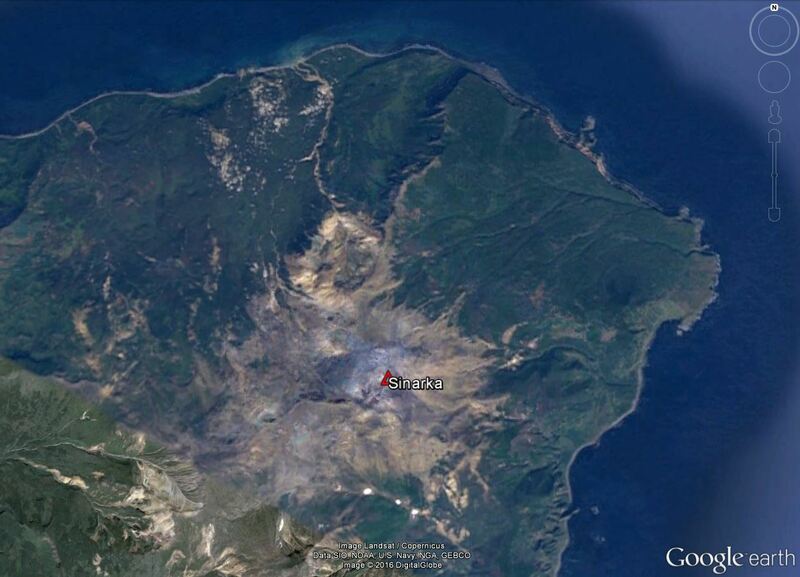 Sinarka volcano, occupying the northern end of Shiashkotan Island in the central Kuriles, has a complex structure. A small, 2-km-wide depression open to the NW has been largely filled and overtopped by an andesitic postglacial central cone that itself contains a lava dome that forms the high point of the island. Another lava dome, Zheltokamennaya Mountain, lies 1.5 km to the SW along the buried SW rim of the caldera, and a smaller dome lies along the northern caldera rim. Historical eruptions have occurred during the 17th and 18th centuries. The last and largest of these, during 1872-78, was once thought to originate from Kuntomintar volcano at the southern end of the island, but is now attributed to Sinarka (Gorshkov, 1970). There is no Deformation History data available for Sinarka. There is no Emissions History data available for Sinarka. Sinarka is the northernmost of two volcanoes forming Shiashkotan Island that are connected by a narrow isthmus about 1 km wide (out of view to the bottom). This Space Shuttle image (with north to the upper left) shows the complex summit region of the volcano. Historical eruptions have occurred at Sinarka during the 17th and 18th centuries. The last and largest of these, during 1872-78, was once thought to originate from Kuntomintar volcano at the southern end of Shiashkotan. NASA Space Shuttle image ISS005-E-6516, 2002 (http://eol.jsc.nasa.gov/). There are no samples for Sinarka in the Smithsonian's NMNH Department of Mineral Sciences Rock and Ore collection. Large Eruptions of Sinarka Information about large Quaternary eruptions (VEI >= 4) is cataloged in the Large Magnitude Explosive Volcanic Eruptions (LaMEVE) database of the Volcano Global Risk Identification and Analysis Project (VOGRIPA).